Below are the complete details of the Mason jobs in Naveed Trade Test & Technical Training Center in Swabi. Skills Required for Job: Candidates must have Good Communication Skills. Good Team Working Skills. Good Interpersonal Skills. Qualification: Mason Jobs In Dubai. Attractive Salary Package. Test/ Interview Date will be 13rd January 2019. 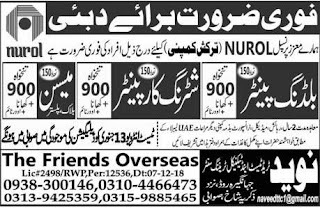 Mason jobs in Naveed Trade Test & Technical Training Center Swabi, in Pakistan published on Paperpk.com from newspaper on January 08,2019. Job seekers who are already working as Tile Mason , Block Mason , Mason , Plaster Mason , General Mason , Marble Mason , Concrete Mason can also apply for post of Mason.